To pick up the fuse, need to know the following: fuse what denominations you need and what fuses recommended by the manufacturer. 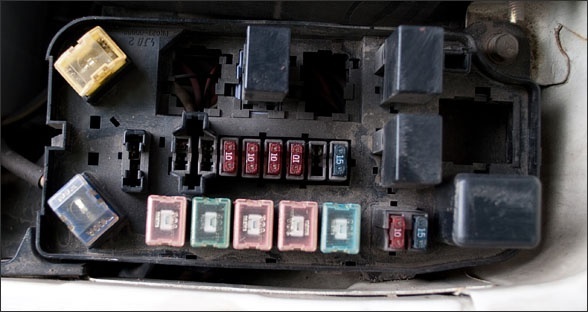 Before replacing the fuse, it is recommended to find the cause of the excess current. fuse what denominations you need, what fuses recommended by the manufacturer. After you have learned all that is needed, you just need to buy it in the shop. As a rule, one by one the fuses are not for sale, so you'll have to buy a set. Their number depends on the car, from the same and the cost. Sometimes it so happens that the fuse recommended by the manufacturer is not available, then you can either order them and wait until they come to the warehouse, or install a similar, suitable connectors and parameters. When selecting fuses, it is very important to buy the products of the company, which is listed on the packaging, not to buy counterfeit. On the one hand, it is a trifle, where you will not earn much, and on the other, every day in Russia burn out thousands of fuses, so the "pirates" quite often they are fake. And finally, most importantly. If happened that the fuse is blown, before replacing it you need to find the cause of the excess current. This may be the exposure of the positive battery wire and, as a result, a short circuit. Another reason could be the surge in current, for example, during a large load on a motor.